Inflammation of the sensitive laminae of the hoof, especially in horses. Also called founder1. A nonspecific term for inflammation of any lamina. A painful condition affecting the base of the ungulate (horses, cattle) hoof, which is characterised by inflammation of the digital laminae of the hoof. a disease of horses and housed dairy cattle, characterized by damage to the sensitive laminae of the hooves, and clinically by severe lameness, especially in the front hooves. 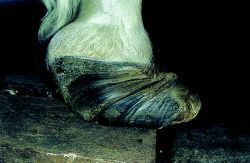 There is heat and pain at the coronets and in bad cases protrusion of the third phalanx through the sole of the hoof. Most cases are caused by severe toxemia, as in engorgement on grain or metritis in the mare, and are called metabolic laminitis. Sporadic cases in heavily pregnant, overfat mares are referred to as puerperal laminitis. Some are caused by trauma, such as in pawing due to boredom or in horses transported over long distances without rest, and are called traumatic laminitis. Called also founder. The clinical signs of laminitis more frequently observed are intense podal discomfort, lameness and difficulty in stay in the quadrupedal position, with changes in corneal apparatus of the hoof. Therefore SARA was not accompanying to laminitis for the animals involved at the present study. The Pharmacologic Basis for the Treatment of Endocrinopathic Laminitis. Heat stress may be a risk factor for laminitis in dairy cows as it limits the amount of time cows spend in stalls (Cook et al. Careful control of grazing should reduce the likelihood of instances of laminitis but when it does occur rapid veterinary treatment is essential to minimise the effects of this potentially life-threatening disease. The suggestion that laminitis may be linked to a host of apparently unconnected ailments, may enable a more holistic approach to horse care. Excesses of energy can cause obesity, which can in turn cause many metabolic diseases such as laminitis (founder), osteochondrosis, epiphysitis, tying-up syndrome, and colic. It has long been recognized that ruminants switching from a natural diet of browse (a cellulose-based diet) to one of more readily digestible carbohydrates (a starch-based diet), such as corn and wheat, are predisposed to developing conditions such as enterotoxemia, polioencephalomalacia, acute rumenitis, liver abscesses, laminitis, and to sudden death. Then they look at several pathologic conditions, devoting a special section to laminitis. What Barbaro did win Monday, with his racing career and his fight against the fractures and the subsequent onset of the hoof condition called laminitis, was a share of the Eclipse Award for Owners of the Year for Roy and Gretchen Jackson (who tied in the voting with Bernardini owner Sheikh Mohammed), a ``special'' Eclipse for the Jacksons and Barbaro's veterinarians Dr. When a horse breaks a leg and is placed in a cast, an excessive load is created on the opposite foot; laminitis results when the phalanx (a bone analogous to a knuckle in humans) is torn from the inner wall of the foreleg, driving the wedge-shaped pedal bone into the sole like a knife. Laminitis can develop even when small amounts of walnut shavings or dust are in the bedding.